The newsroom features the latest news about Applied Aeronautics, including product launches, company news and events. Test Site Bravo in Tornillo, Texas, on the eastern fringe of El Paso County, will serve as the flight test range for cSETR’s burgeoning UAS program. The new test site will see a runway and completion of other test and evaluation infrastructure development within the next two years. The center already has grown its UAS fleet to 11 state-of-the-art aircraft and expanded laboratory facilities to support UAS research and development. 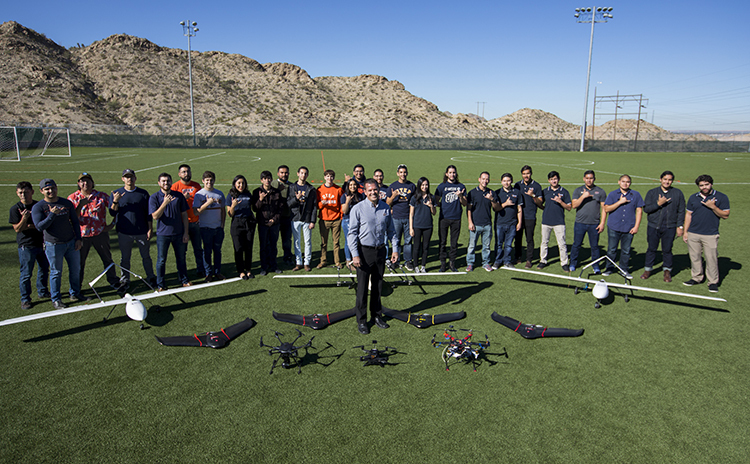 UTEP’s growth in east El Paso County represents the realization of efforts to turn the region into a vital component to meet the workforce needs of a rapidly-growing segment of the aerospace industry. Oklahoma State University researcher Dr. Jamey Jacob has dreamed for over 30 years of marrying technology to meteorology for more accurate weather forecasts. “We’re just trying to get the autopilots in there. We just want them to fly automatically. And they will take pictures and we have a program that will stitch all the pictures together and they’ll be GPS tagged,” Wooten said. “Fifty-five countries around the world, and government agencies far and wide,” Schubarth stated. FutureScape 2018 lived up to its title as Survey Drone unveiled the latest aircraft in their fleet of unmanned aerial vehicles. The Applied Aeronautics Albatross, imported from Texas USA, is one of the largest fixed wing survey platforms in the UK and will enable the company to undertake ever larger surveys on sites in the UK and overseas. With a wingspan of 3m, the Albatross certainly made an impression at Futurescape, hovering above our Quest UAV Datahawk and DJI multi-rotor aircraft. Applied Aeronautics, the affordable commercial drone provider, today announced tremendous company growth led by booming year-over-year top-line performance. Further, in 2018, Applied Aeronautics doubled its customer based, expanded its suite of proprietary technology, increased its employee count, and grew its facilities in Austin, Texas. The advantages of fixed-wing drones over quadcopters are many and varied. For starters, fixed-wing platforms are more operationally efficient than quadcopters. This translates into longer flight times, extended range and consequently more ground covered per mission. The Applied Aeronautics Albatross, equipped with technology from leading Queensland firms, was on display last week at the signing of a partnership between The Boeing Company and the Government of Queensland. Applied Aeronautics today announced that it has successfully doubled its production capacity in less than two years. The California based company designs and manufactures affordable, long range UAVs for the professional market. Applied Aeronautics, the US manufacturer of affordable workhorse UAVs, today released an upgraded model of Applied HD, their encrypted, low latency, HD video streaming device. Applied HD, which previously transmitted high definition video via it’s onboard transceiver has been upgraded to include 4G LTE transmission capabilities. This is the result of several weeks development and testing by the core PX4 dev team. After numerous tests with the Bormatec Maja we switched to our target aircraft, the 3 meter wing span Albatross UAV from Applied Aeronautics. Applied Aeronautics, a manufacturer of unmanned aircraft and airframes, has announced that it has begun delivery of its Albatross UAV platform. The Albatross is the first in a comprehensive line of products designed to bring utility UAVs to everyday customers. In his work with the United Nations, Nathan Moses, M3 Consulting Group, presented his drone related research Monday to an international group focused on developing management and potential eradication programs to combat the recent outbreak of Zika Virus and other mosquito-borne diseases in Latin America and across the world. Applied Aeronautics LLC, today announced the official release of the much-anticipated Albatross UAV platform. The Albatross will be the first in a line of products designed to democratize high performance UAV technology for businesses and individuals. Applied Aeronautics sees its new Albatross drone as one perched between two extremes in unmanned aircraft: the low cost and high breakability of traditional hobbyist drones on one end, and the high cost of durable, professional drones on the other. With a crowdfunding project well under way, Applied Aeronautics hopes that its drone can swoop into the sweet spot in the middle, creating a useful tool that people can actually buy and use.